Whether you desire to teach music in a school or a studio, in the United States or overseas, the music education program at Bob Jones University will prepare you to be an effective, innovative and Christ-centered musician-educator. Our program is approved by the South Carolina Department of Education, and leads to initial South Carolina state licensure (certified to teach K-12 in a public school setting). Graduates from BJU’s music education program have been accepted into leading graduate schools and are teaching in the United States and around the world. Through classes such as Introduction to Music Education and the examples of your professors, you’ll begin to learn what it means to be a Christian musician-educator and how teaching music fits into the broader education profession. You’ll learn from historical influences and current trends in music education and develop your own philosophy of music education based on a Christian worldview. You will choose voice, keyboard (piano or organ), guitar or one of the standard orchestral instruments as your principal proficiency. In addition to classes for your principal, you’ll take a variety of instrumental classes to prepare you to competently teach various musical instruments. You’ll study music theory, conducting and teaching methods, exposing you to diverse instructional methods and familiarizing you with up-to-date educational technology. You’ll also create standards-based lesson plans with integrated technology, accommodations for exceptional learners, appropriate assessment and much more. Throughout your years at BJU, you’ll gain real-life experience in the classroom, culminating in a semester of clinical practice your senior year. You’ll have the opportunity to work with a teacher in a local public school and receive timely feedback in weekly meetings with a BJU professor. Education classes, a semester of clinical practice in a local public school, passing scores in the PRAXIS II exam and a favorable recommendation lead to South Carolina state teacher licensure for K-12. BJU’s liberal arts core, including classes such as economics, philosophy and speech, will challenge you to see life from a broader perspective. These subjects will also help you to develop essential life skills like critical thinking, problem solving, creativity and effective communication—skills necessary for flexibility in an ever-changing job market. Because of the highly specialized nature of the music education program, most electives are part of program requirements, such as the instrument class electives. The music education program at Bob Jones University thoroughly prepared me for success. The time management required at BJU to maintain classwork, attend rehearsals, and sustain a social life prepared me for the non-stop demanding life of a band director. I teach 4th graders with no prior knowledge to play an instrument, as well as seniors who have been playing their instrument for over 9 years. The methods classes I took corresponded directly with this wide spectrum of students. From creating a budget for the instrumental arts program to putting a clarinet together, the BJU music education courses provided a practical foundation that every aspiring band director would need to be successful. The Division of Music also provided top notch performing opportunities. Being a member of the Wind Band and the Symphony Orchestra allowed me to experience playing tough classical literature, premiering new literature, and performing at venues across the United States. These memories and valuable musical experiences are things I want to create for my students. The secret that makes the music education program at BJU better than any other college is the professors. These professors have dealt with every situation imaginable. Their expertise provides students an inside look at what it takes to have a successful career. Most importantly, the professors care for their students on a personal level. 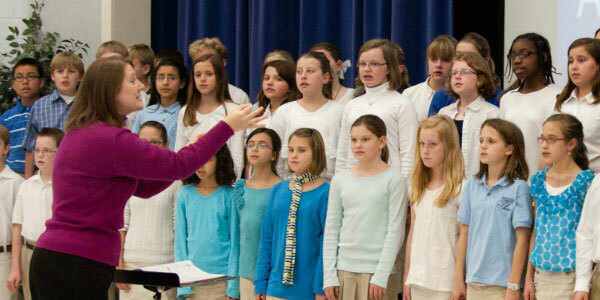 You will regularly see faculty working with students after class or attending students’ recitals. When you walk into the dining common, you will notice faculty eating lunch with students. This genuine interest in the lives of their students creates an atmosphere that is very conducive to learning and forms relationships that last beyond our time at BJU. The Music Education program at BJU opens the door to many career possibilities, from teaching music in a public or private school to giving one-on-one lessons in a home or studio. Flute teacher, Musical Innovations, Greenville, S.C.
ABA therapist for children with autism, Ariz.
Public school principal, Greenville, S.C.
Charter school music teacher, Ariz.
At the annual Christian School Recruitment Conference, representatives from approximately 60 Christian schools—across the United States and overseas—visit our campus to present their ministries, network with students and conduct interviews with prospective graduates. Your teaching preparation moves gently from classroom observations to after-school tutoring to practicum two mornings a week. Meanwhile, your methods classes will give you plenty of practice in lesson planning. By the time you begin your clinical practice your senior year, you will be well-prepared with numerous lesson plans under your belt and at least 100 hours of classroom experience. Clinical practice, the capstone experience of your teaching preparation, gives you the opportunity to work with a mentor teacher in a local public school and receive timely feedback in weekly meetings with a BJU professor. This semester of clinical practice, along with completion of required classes, passing scores in the PRAXIS II exam and a favorable recommendation, leads to South Carolina state teacher licensure for K-12. Membership in the University’s bands, orchestras, or choirs will provide you with unparalleled opportunities for further development of your musicianship under the direction of our accomplished faculty conductors. You will also be challenged to achieve your best in your chosen principal through private lessons, culminating in a senior recital. You may choose voice, keyboard (piano or organ), guitar or one of the standard orchestral instruments as a principal. Every fall Bob Jones University hosts the Special Olympics Developmental Games for students from Washington Center, a school for children and young people with severe mental disabilities. Music education majors from BJU assist the student athletes in musical activities and games as the athletes’ families and teachers cheer them on. The University Educators Association also provides programs and activities that complement BJU’s teacher preparation program. Membership is $20 per year. Our award-winning, student-led NAfME chapter provides opportunities for leadership development and service activities, a series of music education seminars featuring distinguished guest clinicians and lecturers throughout the year, and an annual trip to the South Carolina Music Educators Association Professional Development Conference. So be ready to ask lots of questions—every bit of their experience will be invaluable to you as you grow in your content knowledge and develop your teaching skills. Perform with satisfactory technique and artistry as a voice, keyboard (piano or organ), guitar or orchestral instrumental principal. Design effective lesson plans and assessments using appropriate methods, materials and technologies for instrumental, vocal and general music education. Apply one's own musicianship, content knowledge and pedagogical skill to the teaching of music in an effective and engaging manner.